Ever come across a recipe that is so simple, and even though it's not from scratch, you know it's a keeper. Especially for when you need something quick, but also need it to be a bit extra special. 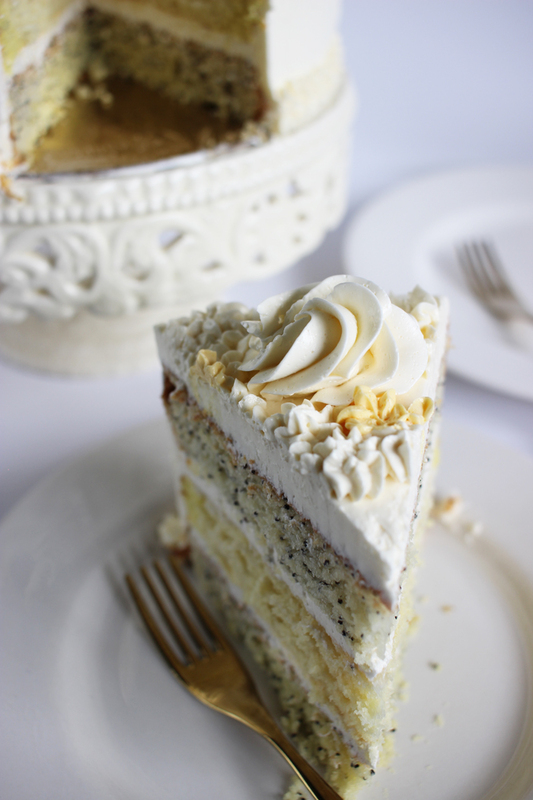 This lemon poppy seed cake is that type of recipe. I had never baked a box cake mixed with pudding before, but the addition of the vanilla pudding in this recipe, plus the poppy seeds makes for a really special treat. 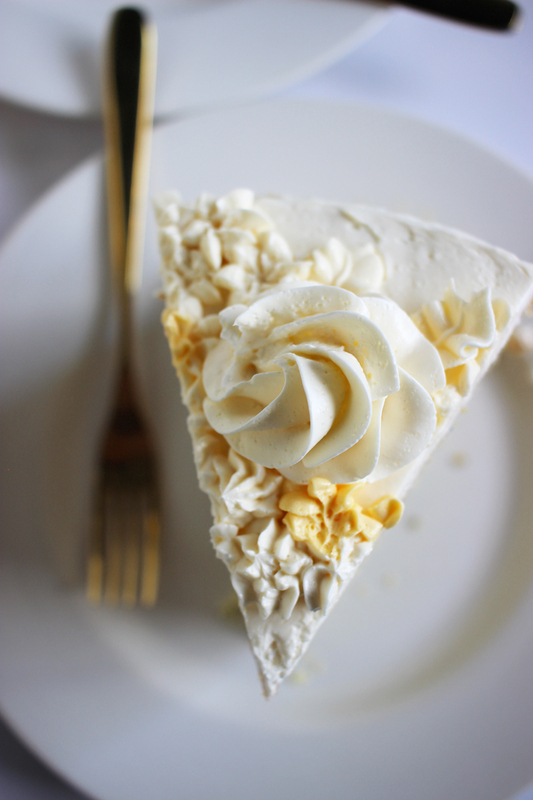 Add a Swiss meringue buttercream, and this cake won't disappoint. Also as an addition, I've been practicing my decorating skills, inspired by so many instagram bakers, including our friend Lyndsay of Coco Cake Land and Ellen of Milk and Water Baking Co. Had to give them a shout out! Be sure to check them out! And check out the recipe below! Let us know if you try it! This recipe is adapted from the back of Watkins' Pure Lemon Extract box. It's true. Such a good recipe! The original cake asks for lemon zest, which is nice, and maybe good for a casual loaf cake, but I like to leave it out for fancier cakes. Yields 2 - 9 inch cakes. As an option, for this cake I add one more layer, stealing a layer from our Lemon Wedge Cake recipe from last week. 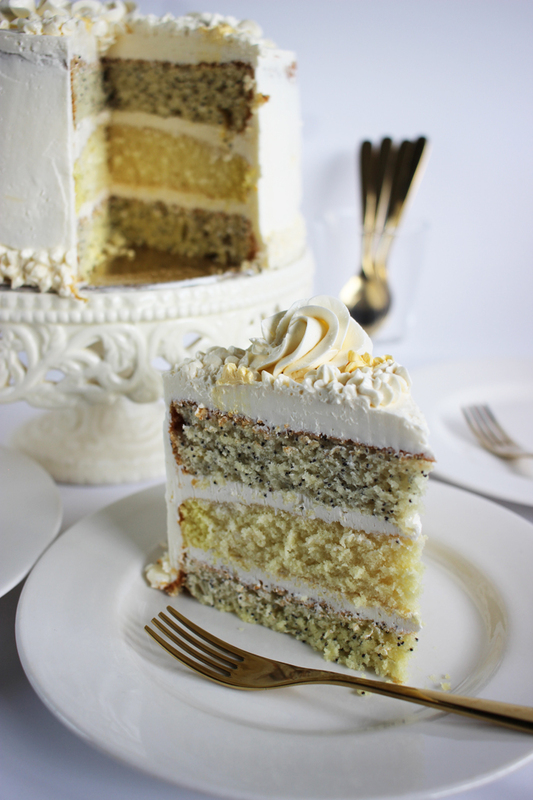 (Optional) plus one layer of Lemon Wedge Cake (see recipe here). Mix all of the ingredients (see, so simple) in a large bowl for two minutes or until blended. Pour into greased and floured cake pans. Bake at 350 degrees F. for 40 minutes or until a toothpick inserted comes out clean. Cool in pans for about 20 minutes before removing them. Set Aside. 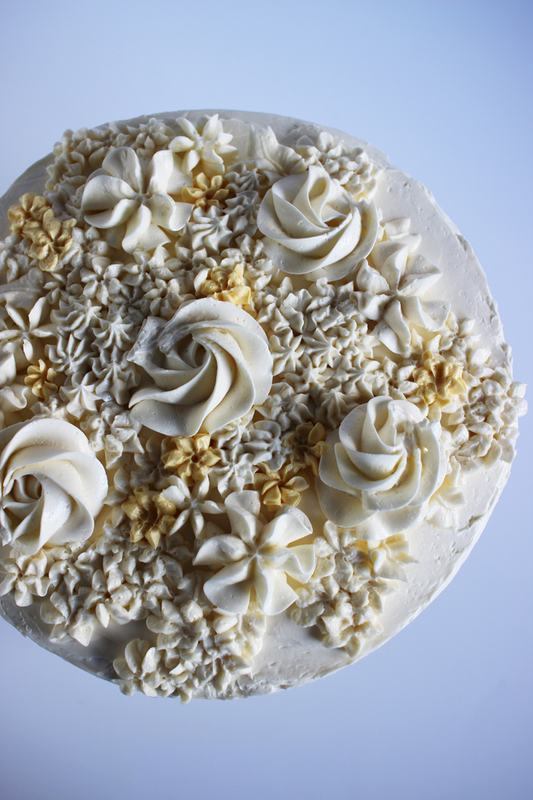 (Check out the Swiss meringue buttercream recipe after the jump)! To make this icing, you'll need something that resembles a bain marie. A pot on the bottom to bring the water to a boil and a bowl that will easily sit atop of the pot, and something you're still able to grab. I made two batches of this icing to cover the entire cake plus the flowers. 1 pound (4 sticks) room temperature unsalted butter (cut into 1 tablespoon size pieces). Start the water to boil in the pot. Once it comes to a boil, turn down to simmer. In the bowl, add the 5 egg whites, the sugar and the salt. With the bowl placed atop of the pot, start to beat the egg whites, dissolving all of the sugar as you go. This takes approximately 3 minutes. Remove from heat. Continue to beat until peaks start to form in the egg whites and when the bowl is cool to touch. This takes approximately 7 - 10 minutes. Slowly start to add the butter, one tablespoon at a time, until it is well incorporated. Continue mixing until all the butter has been added. Add the vanilla at the end. Mix well. Separate the icing into 2 different bowls. One with a third of a cup - which you'll add yellow food colouring for the yellow flowers, and then leave the rest white. 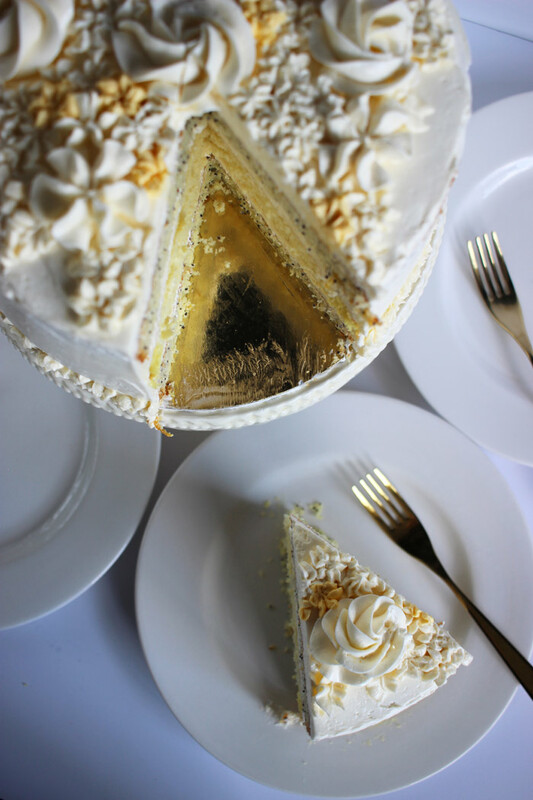 Ice in between each layer of cake. Ice the cake (a thin crumb coat) to start. Then transfer the icing into icing bags. To ice, check out the video below - it's a simple way to decorate a cake. For these flowers I used, the Wilton 1M and 2D tips for the larger flowers and the Cake Boss 193 and 18 tips for the smaller flowers and then a smaller leaf tip for the leaves. If you haven't iced like this before, practice to start on a plate, and in no time you'll be able to make these like a pro! (Seriously, I practiced for about 5 minutes). If you have the right icing consistency (Swiss Meringue Buttercream is a game changer), it's pretty easy!